Here is a class that I have been working on for inclusion in the basic game. The sorcerer is a magic-user that has natural arcane talent. He does not study magic or keep a spell book. Rather, his spells are natural talents, and often manifest themselves in idiosyncratic ways. Some sorcerers must engage in particular activities in order to trigger their abilities (e.g., dancing or drawing runes), while others must merely concentrate (decide during character creation). Spells that require somatic components in the rules still require some bodily movement, though the nature of that movement should conform to sorcerer in question. No sorcerer spells require material components. Sorcerers can not create magic items. The sorcerer uses the same spell progression table as the magic-user, but does not need to memorize spells. Instead, he accumulates a number of spell slots equal to the value of each spell he has access to. For example, a third level sorcerer can cast two first level spells and one second level spell. Thus, he has 4 spell slots, and can use these to cast any combination of spells the level of which he has access to. This wizard could cast 4 first level spells, 2 second level spells, or 2 first level spells and 1 second level spell. He regains use of all spell slots after an extended rest. (I’m not sure about this method of regaining spell slots, but I don’t have any other ideas right now.) Perhaps some sort of active recovery would work better. A sorcerer may cast the same spell more than once, but each time it is cast, the cost in spell slots increases by one. For example, say that a sorcerer has the sleep spell. The first time he casts sleep, it uses up one spell slot. The second time he casts sleep, it expends two spell slots, the third time, three slots, etc. I’m quite happy with this mechanic, because it encourages the use of more than one spell (the danger with spell point systems is that the caster might merely employ fireball after fireball, which limits creativity). It also reflects the way the sorcerer’s casting is less precise and systematic than a scholarly magic-user. When the sorcerer gains a new spell slots, he rolls on the magic tables for a new spell. The sorcerer can not learn new spells in any other way, and can not teach other magic-users his spells. This means that some levels a sorcerer will gain more than one spell. For example, when going from sixth to seventh level, a traditional magic-user gains one first level spell slot and one fourth level spell slot. A sorcerer undergoing the same level transition would gain 5 spell slots (1 + 4) and two new spells: roll randomly once on the first level table, and once on the fourth level table. Re-roll if the result is a spell that the sorcerer can already cast. I would encourage players and referees to not re-roll spells in any other case, because the idea of chance, chaos, and lack of control are inherent in the concept of the sorcerer. Respect fate. Once per day, the sorcerer can let loose wild energies and cast a random spell. This uses up all remaining spell slots, with level balance being made up by damage. The spell cast thusly may be of any level, even a level that the sorcerer can not yet cast, but the targets and all details are up to the referee. Such random spells may only be cast during a time of great stress, such as during combat. I’m not sure about this ability yet, but I really like the flavor. Perhaps the random spell should not be of any level, but rather the sorcerer’s level + N (maybe N = 3?). There is a 50% chance that a critical failure results in a spontaneous spell discharge of one of the spells the sorcerer can normally cast. The wild magic drains spell slots if available, and if they are not available, the balance is made up by damage. A sorcerer can not be killed by damage from his own spell casting. Instead, if such damage reduces him to 0 HP, he is knocked unconscious and is stable at 0 HP. The sorcerer can use leather armor but no shield and simple weapons. Club, short sword, light crossbow, spear, quarterstaff, dagger. This entry was posted in Uncategorized and tagged class on August 24, 2011 by Necropraxis. You have received notice that the great sorcerer, Wolfgang Constantine, your patron and friend, has died in mysterious circumstances. The missive further indicates that you were included in the wizard’s will, and as such have been bequeathed a part of the Blackwater Falls estate. So began one of the most successful RPG campaigns that I have participated in. This was in the late 90s. Some friends and I were tired of campaigns that did not last, so we wanted to put something together that would require a very small upfront investment in preparation, and would not require extensive referee work from any one person. We called this a “house” game, since the PCs started and ended every session at the Blackwater Falls mansion. At the time we attributed the campaign’s ultimate success mostly to the idea of referee rotation and the “house” concept (which we borrowed from some older White Wolf gamers, though I don’t know if the term was in general use). Looking back on this now, though, I think that the real reason the campaign worked was that we had unwittingly stumbled upon many of the principles of old school gaming. The lack of initial setting specification. The megadungeon (in the mansion). The lack of too much pre-planned plot (mostly due to the rotating referee duties). In other words, we started with only the principles of what would make a successful RPG, and we ended up with old school D&D (the rules for adjudicating success and failure were different, but the way we played the game was remarkably similar). The only major principle we were missing was the use of random tables. The focus on treasure was even there, since all the characters started out poor, but needed to accumulate funds to pay off Constantine’s debts. 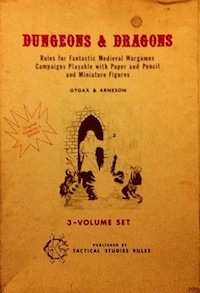 The game started using AD&D 2E rules (with some modifications to support a pseudo-Victorian and steampunk setting), but after some play was transitioned to a generic homebrew skill system based roughly on White Wolf games (after all, back then the smart kids were playing Vampire and Mage, not D&D). But the rules were mostly immaterial. It was the sense of exploration, at least for me, that made the game work. That’s what makes the OSR so fascinating to me, getting back into this hobby. I’m currently running a 4E game (3 sessions in), more or less because that is the system my coworkers expect. I hope to make use of some of the old school ways though. In fact, I partly see this blog as an investigation into the following question: can an old school sandbox game be run effectively using a modern ruleset? I am greatly inspired by the empirical style of James Maliszewski’s Dwimmermount campaign. My experience so far is that combat is slow, clunky, and does not lend itself well to creativity and imagination. But I don’t yet consider this to be a fair appraisal, because I am still learning the rules (as the referee), and we are playing with at least one player who has never played any tabletop RPG before. This entry was posted in Campaigns on August 21, 2011 by Necropraxis.